Charles Erwin is a High School and College graduate from the State of Texas. He received a Bachelor of Science degree in Computer Science from East Texas State University, which is now Texas A & M University Commerce. He worked as a programmer, manager, or consultant in the fields of Systems Engineering and Data Processing for various Fortune 500 companies more than twenty years. Outside of his computer consulting company, Charles has been involved in other entrepreneurial pursuits. He was one of the principal partners in an Executive Protection company as well as an owner in diverse companies ranging from Laboratory Analysis and Abatement of hazardous substances to Restaurateur. In the study of Income Taxes, he has hosted and/or attended weekend seminars on tax laws for many years. The Income Tax seminars were the catalyst which launched Charles into researching the laws of the UNITED STATES and the Constitution. 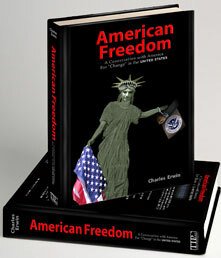 American Freedom a Conversation with America for “Change” in the UNITED STATES is the culmination of years of investigation by Charles Erwin to find the Truth.